After more than a year of discussions, negotiations and arguments on the matter, my roommate had finally pulled it off. 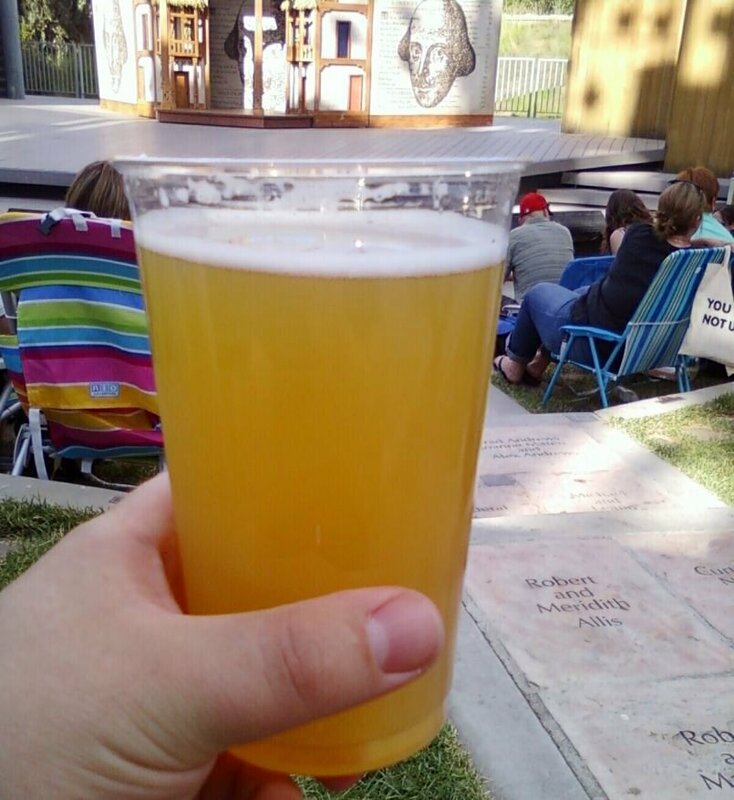 After offering to buy the tickets, finding a performance we both wanted to see on a night that worked for both of us and ensuring we had a sitter for that night, she had finally accomplished something that many have tried to over the last nearly two decades: she had gotten me to accompany her to The Idaho Shakespeare Festival. Don't get me wrong here. I don't have any issue with Shakespeare, I don't have any issue with live theater...hell, I've been interested in going in the past. Still, I could always find better things to spend the money on. She saw that Achilles' heel and pounced on it by spending her money. So, there we were. We had picked up our tickets, rented a couple of those half-chair things, found our seating area and set up said chairs, and now we were headed to get some food before the performance started. I had to admit, I was digging the atmosphere. It was relatively quiet considering all the people, the buildings were nice, there were lots of trees around...shouldn't have expected anything less from a place so near the offices of the Department of Parks & Recreation Department, I suppose. As we walked through the open stretch between the amphitheater and the concessions area, a loud clattering started off to our right. Suddenly a deer ran between us and the dining tables and, slowing only a little to take in its surroundings, tore off again down a path through the trees. I was stunned. The ladies at the table nearest the trail the deer had disappeared down laughed slightly nervously. My roommate, who had been warning me to keep an eye out for deer for the entire drive down Warm Springs Avenue, simply said "I told you so." Shaking the cobwebs from my mind, I brought my focus back to the secondary reason I had gone along on this little adventure: the food. It is of course easier these days to get me to go somewhere if I can get a write-up out of it, and directly ahead of us loomed Café Shakespeare. 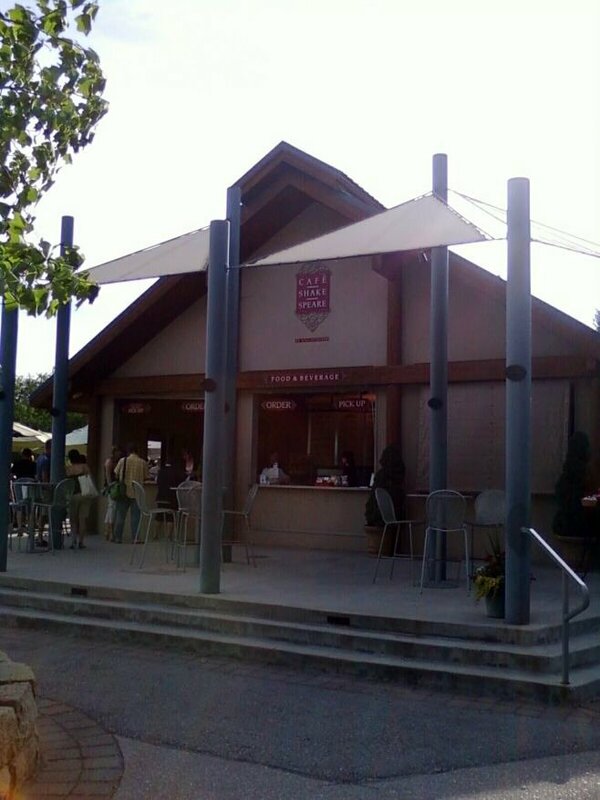 Café Shakespeare's menu consists mainly of fare appropriate for picnics: sandwiches, salads, snack platters and even a few deluxe meals for two described as "picnic baskets". Both of us chose a "box dinner", which is a sandwich, fresh fruit cup, side salad and a cookie: Italian Grinder with pasta salad for me, Mediterranean Turkey with potato salad for my companion, and a snickerdoodle for each of us. On the drink front, the roommate got a soda while I opted for an Ice Cold Shandy, a blend of beer and freshly-squeezed lemonade. The roommate sampled the Shandy first, and when I asked her what she thought her response was "It could be colder." I took a sip myself and thought perhaps they should reconsider the name. The flavor was good (reminding me a little of a summer drink recipe I make sometimes (incorporating beer, lemonade and vodka, yum!) , but the temperature was sort of like when you pick up soda at the store to have with dinner, stick it in the freezer for an hour hoping it will get cold, and when the time comes it isn't cold but it's "cold enough" so you drink it anyway. Anyway, it didn't take long for our boxed dinners to be assembled, and a few minutes later we were back in our half-seats and ready to dig in. One thing my companion had been very explicit about was that I should NOT bring my camera, and that if I was seen using one it would likely be confiscated. So there I was, sitting on a concrete and grass step, trying to get my food arranged inside its box so that I could get a pic with my phone before one of the employees spotted me. Finally, with everything more or less to my satisfaction, I snapped a pic. Still trying to be sneaky, I brought up the picture on my phone's display and was pretty happy with it, all things considered. I pulled out the sandwich and joked about the "by Lisa Peterson" sticker on the wrapping. I guess she must be something of a name in local catering to warrant that, but there was something else about the sticker that was bugging me. I stared at it for a few seconds before it finally hit home. 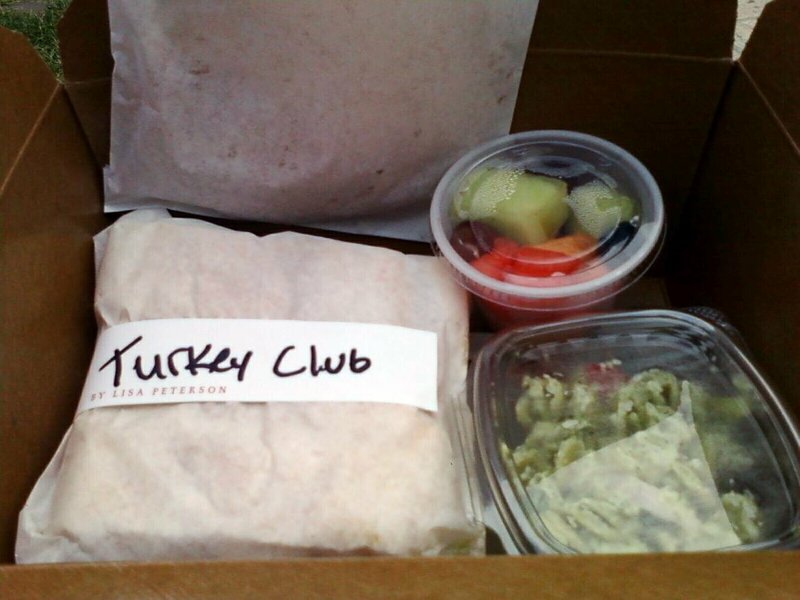 I asked my roommate if she had ordered the Turkey Club, and she reminded me that no, she had ordered the Mediterranean Turkey. She opened her box and revealed my Italian Grinder. We unwrapped the sandwiches, and both wrappers contained what the stickers indicated. She said it wasn't a big deal, but I figure that if you're paying thirteen bucks for a sandwich you should at least get the one you want, so after stashing the Grinder in my box I took the Club back to the eatery to exchange it. Her Mediterranean was sitting behind the counter so it was a quick swap, and I was soon back in my seat and ready to dig in. The mild irritation I was experiencing due to the order mix-up and the temperature of my beverage was largely relieved once I bit into my sandwich. To be honest, I had kind of expected a typical deli sandwich, but that's not what I got. 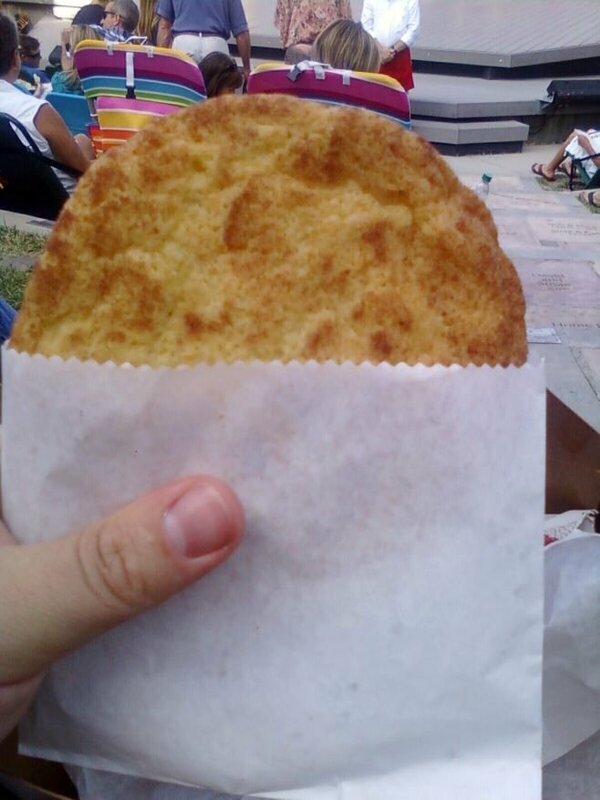 The bread was terrific, soft and chewy inside with a thick, crispy crust. 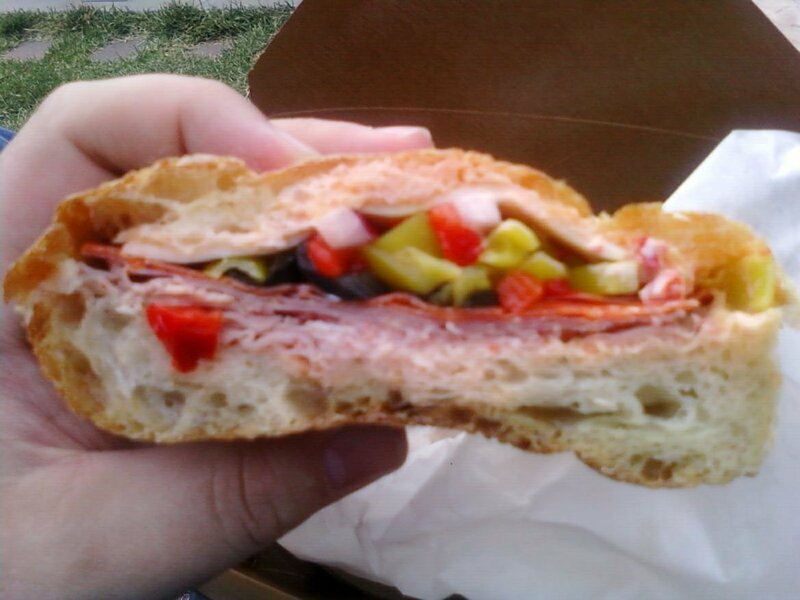 Inside was shaved ham, pepperoni, Genoa salami, pepperocini, roasted peppers, provolone cheese, black olives, red onion and red pepper mayo. It's not what I would necessarily be wanting if I walked into a deli and ordered a Grinder, but as an artisan interpretation it was very tasty. The pasta salad really grabbed me too, I haven't had a lot of pesto-based pasta salads, but the spiral pasta picked up the sauce wonderfully, and I loved the fact that they had halved the cherry tomatoes so that the sauce could get inside them as well. It's a recipe I definitely intend to use as a starting point to make my own pesto pasta salad soon. No pictures of the roommate's food I'm afraid, too paranoid about the camera thing to be trying to shoot things on her lap. I did try the potato salad (made with a thinner dressing than I'm used to and with pieces of yellow pepper scattered throughout) and her sandwich (turkey, romaine lettuce, artichokes, roasted red peppers, cucumber, red onion, pesto aioli, and marinated feta spread), both of which were also very good. I still liked mine better though. The cookie was another high point of the meal. I love snickerdoodles, but more often than not they seem to be nothing more than sugar cookies dusted with cinnamon, usually still a little too chewy in the center or filled with undissolved sugar crystals. These were crisp on the outside, soft on the inside, and the cinnamon seemed to run all through them without becoming an overwhelmingly dominant ingredient. By themselves, the cookie are $1.95 each, and I would seriously consider dropping by just for one of those if I was in the neighborhood. As we were were finishing our meals, I noticed a group sitting at one of the tables to the side of the amphitheater taking pictures of one another. Not long after, a woman in the front row took a picture of her friends. Throughout both of these incidents, a theater employee stood at the front of the stage looking completely disinterested. I pointed this out to the roommate who just kind of shrugged it off. Later, during the fun little opening sketch they use to impart the theater rules to the audience, they basically said that there is no flash photography allowed during the performance itself. So if you have issues with the crappy pictures, it's not MY fault! The play, called The Complete Works of William Shakespeare (Abridged) was one I would recommend...well, except for the part where there are three white guys on stage in sunglasses doing one of those lame comedy raps...I mean the old "Fresh Prince" theme song was better than this. I think if Shakespeare could have seen it, he might have have torn up Othello to prevent that from ever happening. But I digress. At Intermission, we made our way back to the café for coffee and dessert which I didn't get pictures of due to the failing light and the fact that all I had to shoot with was a crappy camera phone. The coffee was a special Dawson Taylor blend made exclusively for the ISF and was pretty good. The desserts, on the other hand, were almost insanely decadent. The roommate got a hunk of carrot cake, which was delicious and had shredded carrots running through it, but which also had an insanely thick and rich icing. I opted for a brownie which looked nice and fudgy but which turned out to be a flaky, not exactly crisp layer on top and bottom containing a center which seemed to be little more than softened dark chocolate. Delicious, but too rich for my tastes and not the kind of thing I'd order again if I were wanting a brownie. I ended up dropping half of it into the grass and having to chuck it, and I'm still not entirely certain it wasn't an act of mutiny by my system to keep me from eating any more of it. (Note: The "value" grade may seem high, but remember that you're basically buying really good concession food here. Think about how much a meal like this would cost if they served it at movie theater prices, and you'll see where I'm coming from.